As mentioned in my Prada bag review, one of the design flaws with this line of bags is the less-structured base. Anything with a little bit of weight will cause the bottom middle to sag. This is not only unsightly, but also bad for the leather which may stretch out with use. I realized this after seeing a lady with an overflowing Prada Saffiano tote – the base looked so saggy and the bottom of the sides had so many stretchmarks that I felt sorry for the poor bag. I was first exposed to the concept of base shapers when my pre-owned LV speedy came with one inside. The purpose of these is so that the weight of the contents can push down on the bag evenly, versus at a concentrated point. I initially went the DIY route and simply cut a piece off a cardboard box. This works just fine if the cardboard is thick enough, but apparently being shorter in stature means others can easily peer into your open-top bag. After having to explain a few times why I had coarse cardboard lining a pricey tote, I decided to spend the $30 or so for a clear shaper. – Their shapers come in 4 options: clear acrylic, mirror, red, and brown. – I can only speak to the clear one, which is fairly lightweight (5 oz) & thin (3 mm) but durable. All the edges on mine were smoothly polished. – Shaper prices start at $15 and go up to $30 for the biggest size. Shipping for most pre-made shapers is $3.50 domestic, and $11-$15 internationally. Custom-sized shaper shipping starts at $6. – They strive to ship on the same business day for pre-made shapers, and have a 12-day turnaround for custom orders. – Prada totes come in so many size options, but if you own this exact same bag (style BN2274), the measurements I provided were 12 and 9/16th inches x 5 and 5/16th inches. My shaper came out exactly per the measurements, and fits the bag nicely. Readers – What do you do to remedy bag sag? 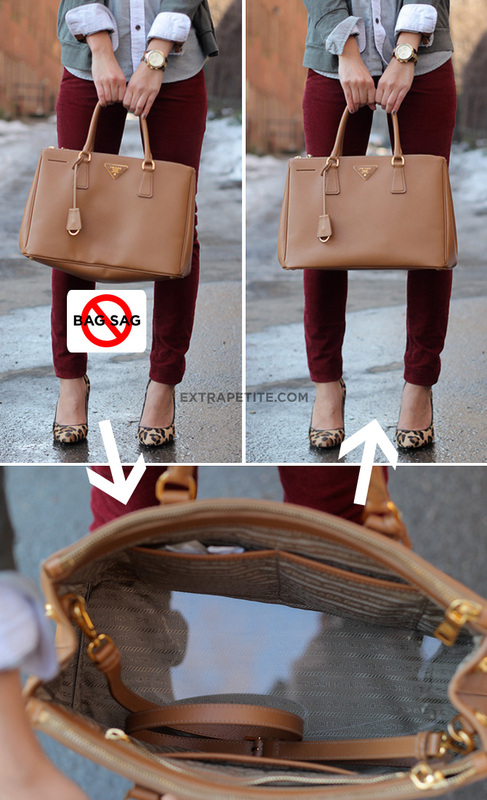 LV and Longchamp owners, do you use anything to help shape the bottoms or do you prefer the slouchy look? I also use a purse organizer which in addition to keeping my stuff in its place and easy to find, also helps preserve the structure of the bag! The shaper seems great too, but jean you should also consider and organizer…I have a pursefection brand and they make them in 2 sizes I think. Thanks for the helpful tip! I love you blog! Hi Jean what is the measurements of your bag, the outside that is, since I am trying to locate it in the prada store. Thank you for sharing Jean. I have a Prada too and LV so will def check them out. thanks for this…just in time before i buy the same prada double zip lux tote. Please please if you could answer my question…Does it bother you that the double zip tote is essentially open and anyone can peek inside? im feeling weird about that…makes me want to buy the prada lux tote without the double zips as that atleast has a button closure to secure the opening!! what do you think??? MY THOUGHT EXACTLY! As far as I'm concerned, this is a design flaw. However, I would agree that for the Prada Saffiano, using a base shaper is the better option. The bag was intended to look shaped and very-well structured, so the sagging bottom doesn't match the original perception that bag gives. OMFG, I just discovered your blog and I'm in love! What's fantastic is that we have pretty much the same stats: I'm 4'11 (and 1/3!!! ), 95 lbs, 32-24-32. Now I can know what's petite-friendly and what will fit me before making the purchase. Hello Jean, My name is Yen. I have been a fan of your blog for awhile now. I resently bought a prada double zip saffiano satchel in large and it seems too big for me. I haven't seen the medium in person yet but it looks much more proportion on you than the large size on me. I thought I may be able to get away with the large size since I'm 5'9". Can you let me know if there is much different between the medium and large? I have seen it in measurement on pictures but not in person. Im not sure if it is because I'm not use to carry a large bag or it is really too big for me. Thanks for helping. P.S. I wanted to email you in private but cannot find your email address. Hi Jean, can you share with me your measurements for this Prada bag? I think I have the same size, but I'm not sure because mine is the black one but it doesn't have the shoulder strap. I bought it maybe 2 years ago. Do you know if the new ones have the straps, or is a maybe a smaller size? Thanks again, and love your blog! I am hoping this will work for my Valentino Garavanni Couture! I didn't think about the lining being black when I purchased it and find that I am always rooting around!!! I am hoping that this red shaper not only gives some structure but also brightens the bottom! Love the bag! such a lovely giveaway – I am sure the future owner will be happy! I am traveling in a day, and just purchased the Planetes tonal, large. I am worried that it dips at the bottom when one adds too much stuff, including a laptop, and loses shape when one does not add enough stuff? Should I find a base for it? This is so helpful Thank You. I am going to purchase the base shaper using the measurements that you've provided. Some of the latest Prada bags are coming with reinforced bottoms (starting last season) so that they won't sag, but you have to ask the salesperson and check for yourself because not all of the bags have been redesigned yet. You can easily tell the difference between one with reinforced bottom versus one without as the ones with reinforcement have a much sturdier bottom. When in doubt, I just take all of my stuff and put it into the the bag that I'm looking into purchasing. If there is even the slightless hint of sag from the very beginning, I know that it will only get worse from there. i have the same bag, what's the exact size that you gave them please? I got my base shaper off http://designerbaseshapers.com/, I had a look at the baseshaperstore, but they're so expensive for custom made base shapers! You can also find plenty on eBay and Etsy! I have a bag that is kinda slouchy at the top, where it only looks good if my bag is full. If my bag is empty, then the top kinda deflates a little. Any tips on how to get the shape right? My solution right now is to have paperwork in plastic sleeves so that it pushes out at the top of the bag. I would love to have a better solution, like a bag shaper.